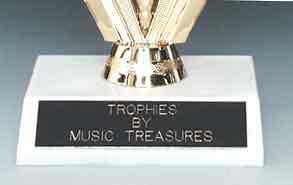 This economical trophy features a beautiful die cast (metal), gold plated wreath with music theme positioned on top of a walnut finished base. 5 inches tall. Specify up to 4 lines of engraving - $3.00 per line, 20 characters maximum per line including spaces!